Over a two day period, I polled my students, STEM colleagues, and school Admin team. I’ve never been so happy to have such a ruckus in my homeroom before school actually began with students arguing their guesses and calculation methods. For the actual lesson, all students downloaded the Excel file and we began to analyze the results. 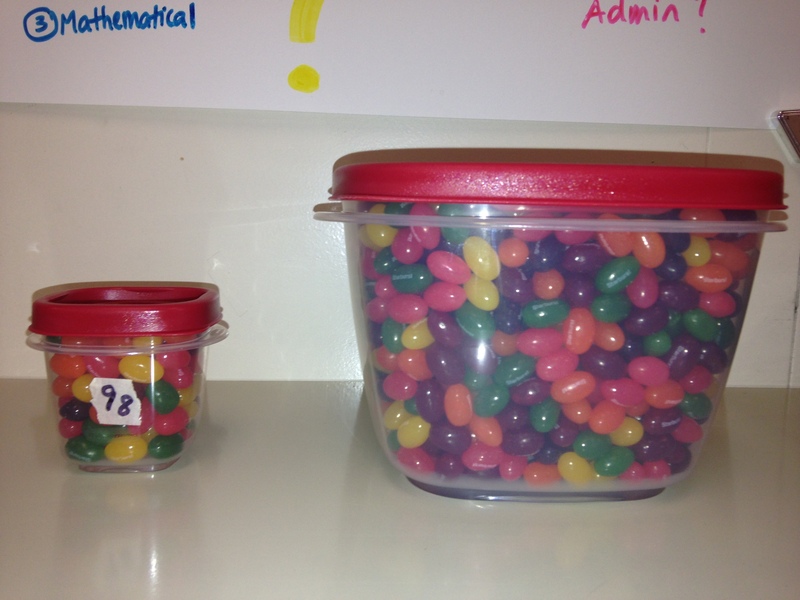 My 9th graders decided pretty quickly that we weren’t playing by Price is Right rules, meaning it didn’t matter whether someone guessed over or under the actual number of jelly beans… which led them immediately to the concept of Absolute Value #teacherwin. 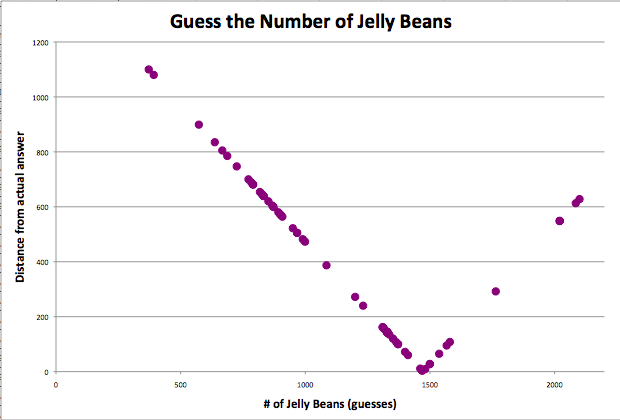 There were 1472 jelly beans in the container, so we all typed in the equation =abs(C2-1472) and populated the rest of the column. I asked students what they thought a graph of (Guess, Distance from Actual Number) would look like, and students overwhelmingly thought we were about to see a graph with data scattered every which way. There were many “What?! How? !” comments as students digested the graph before them. They immediately wanted to know if the graph would always be in that shape, and this led us into our discussion of graphing absolute value functions and describing their characteristics (over the next 2 class periods). Students had to design a poster in Microsoft Word showcasing the results of their experiment and highlighting the characteristics of their absolute value function. I printed and hung all the posters in my classroom, and now in between classes I catch them reading each other’s work. The students and I loved this project and I can’t wait to do it again next year! This entry was posted in activities, algebra1, projects, technology by growingexponentially. Bookmark the permalink. I really like how you set up this activity and can’t wait to try it out this fall. wow. great idea and activity. Could you send me the excel file? Thank you! I added a link to the excel file at the bottom of the post. If for some reason you can’t get it to download, let me know and I’d be happy to email you the file! Thank you for sharing the file! Fantastic. Planning on trying this one! I think this is a great activity and I would love to do it with my 8th grade Algebra students. Could you please send me the Excel file? Hi Marianne, I added a link to the excel file at the bottom of the post. If for some reason you can’t get it to download, let me know and I’d be happy to email you the file! AWESOME!! May I use this? It’s a great lesson. Of course! Use away! I hope your kids have as much fun with it as mine did! I love this project idea! Would you please email me a copy of a student’s project? I would love to show my students an example. Thank you! I love this idea. I used a slightly modified version of this as a kickoff for Algebra 2 honors class this year. It was great. Students definitely expected a scatter plot with points “all over the place” and were surprised to see the “v”. I think this would be a great project to get reworked with Desmos in a similar way to the pennies in a circle investigation. What do you think, Dan Meyer and Team Desmos? Do you a rubric to grade the project? Did this with my 8th grade Alg class today- they loved it! And even though they had seen abs. value graphs, they still were surprised at the results of the data. This project is wonderful! I will be using this for the second year now in my Algebra II class. Here is a link to my project handout, rubric included. Anyone is welcome to copy/edit what I have used; just be sure to keep this “Growing Exponentially” blog post as a reference, since I did not personally create the project. Thanks again for sharing! Awesome!. I’m a brazilian math teacher and I’ll use it in my classes. Congratulations.